The Vickers Mk. E Type B is a Chinese tier 2 light tank. Desarrollado en 1928 por J. V. Carden y V. Loyd. El blindado nunca entró en servicio en Gran Bretaña. Sin embargo, fue exportado a otros países, incluido China. 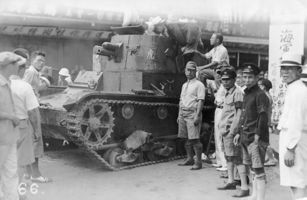 En 1937, veinte vehículos de este tipo lucharon contra las tropas japonesas en Shanghái. El T-26 soviético, basado en los Vickers, fue también exportado a China, y 82 vehículos de ese tipo fueron desplegados en el sur de China y en Burma en 1941-1942. An imported Vickers tank from the British, the Mk. E has worse handling than its tier 2 counterparts of other nations, but it can equip excellent guns. It may be difficult to appreciate due the poor accuracy, yet the Vickers is deadly at close ranges where its gun can easily penetrate any tank it gets to face and cause destruction faster than the rest. 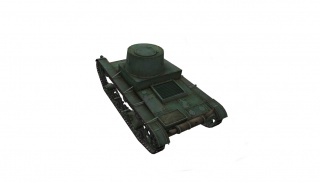 When upgraded to the second turret, it technically becomes a T-26. The Vickers Mk. E Type B leads to the Type 2597 Chi-Ha. This vehicle plays much like a T-26, and is in fact the vehicle the T-26 was based off of. The 40mm Pom-Pom will devastate tanks at this tier with ease. The Gun 45mm 20K is an effective tank-killer as well, and will do in a pinch. Stay in the back- your thin armor will do nothing to stop anything at this tier. Overall, if you have played the T-26, then you will be at home, and many skills learned here will apply to the T-26. Due to the Pom-Pom, it's natural to make a comparison with the Cruiser Mk. III. The Cruiser Mk. III is faster, more maneuverable, and has much faster turret traverse. The VAE benefits from having a much smaller profile than the Cruiser Mk. 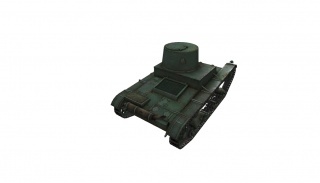 III and it has much stronger front turret armor when equipped with the T-26 turret. It also has slightly better accuracy. The 37 mm KwK 36 L/46.5 Gun carries over from the Renault NC-31. Mount it if you want to. First, research the Franklin Engine. Next, research the T-26 model 1936 Turret. Research either the 45 mm 20K Gun or the 40 mm Pom Pom Gun, depending on your preference. The Pom Pom is generally the superior gun. Now, research the T-26-2 Suspension. Research the Marconi SB-4a Radio, followed by the 71-TK-3 Radio. Finally, research the gun you didn't already research. The Vickers 6-Ton Tank or Vickers Mark E was a British light tank designed as a private project at Vickers. It was not purchased by the British Army, but was picked up by a large number of foreign armed forces and was copied almost exactly by the Soviets as the T-26. It was also the direct predecessor of the Polish 7TP tank. By the start of World War II it was the second most common tank design in the world after the Renault FT. The first Mark E was built in 1928 by a design team that included the famed tank designers John Valentine Carden and Vivian Loyd. The hull was made of riveted steel plates, 1 inch (25 mm) thick at the front and over most of the turrets, and about 3/4 inch (19 mm) thick on the rear of the hull. The power was provided by an Armstrong Siddeley Puma engine of 80–95 horsepower (60–70 kW) (depending on the version), which gave it a top speed of 22 mph (35 km/h) on roads. The suspension used two axles, each of which carried a two-wheel bogie to which a second set of bogies was connected with a leaf spring. Upward movement of either set of bogies would force the other down through the spring. This was considered to be a fairly good system and offered better than normal cross-country performance although it could not compare with the contemporary Christie suspension. High strength steel tracks gave over 3000 miles (5000 km) of life which was considerably better than most designs of the era. Type A with two turrets, each mounting a Vickers machine gun. Type B with a single two-man turret mounting a single machine gun and a short-barreled 47 mm cannon OQF 3-pdr Gun. The Type B proved to be a real innovation, it was found that the two-man turret dramatically increased the rate of fire of either weapon, while still allowing both to be fired at the same time. This design, which they referred to as a duplex mounting, became common on almost all tanks designed after the Mark E.
The British Army evaluated the Mark E, but rejected it, apparently due to questions about the reliability of the suspension. Vickers then started advertising the design to all buyers, and soon received a trickle of orders eventually including USSR, Greece, Poland, Bolivia, Siam, Finland, Portugal, China and Bulgaria. A Thai order was placed, but taken over by the British when the war started. Vickers built a total of 153 (the most common figure) Mark E's. Experience with the Polish machines showed that the engine tended to overheat due to poor airflow over the air-cooled Puma engine. This was addressed by the addition of large air vents on either side of the hull. For a new Belgian order the design was modified to use the Rolls-Royce Phantom II water-cooled engine instead. This engine would not fit in the rear, and had to be mounted along the left side of the tank, requiring the turret to be moved to the right and rearward. One example of the resulting Mark F was tested by Belgium, but rejected. Nevertheless the new hull was used, with the older engine, in the sales to Finland and Siam. The Mark E was also developed as a cargo vehicle, and purchased by the British Army in small numbers as artillery tractors to haul their large 60 pounder (127 mm) artillery guns. Twelve were ordered by the Army as the Dragon, Medium Mark IV', while China purchased 23 and India 18. Poland was generally happy with the design, and purchased 50 and licensed it for local production. Modifying it with larger air intakes, their own machine gun, 360-degree Gundlach periscope. and a Diesel engine, the design entered service as the 7TP. Only the original 38 entered service, 12 remained unassembled and later used for spares. Out of 38 original two-turreted tanks, 22 were later converted to single turret version with a modified turret and the 47 mm main gun (Type B standard). The Soviets were also happy with the design and licensed it for production. However in their case local production started as the T-26, and eventually over 12,000 were built in various versions. The Soviet early twin-turret T-26s had 7.62 mm DT machine guns in each turret, or a mix of one machine gun turret and one 37 mm gun turret. Later, more common versions mounted a 45 mm gun and two DT machine guns. The final versions of the T-26 had welded construction and, eventually, sloped armor on the hull and turret. Because the T-26 was in such wide use and was a reliable platform, a variety of engineer vehicles were built on the chassis, including flamethrowers and bridgelayers. A novel radio-controlled demolition tank was built on the T-26 chassis also. During the Spanish Civil War the Soviet Union sent the T-26 to the Republican Army. The Italians, after suffering losses from Republican's T-26 during the battle of Guadalajara (1937), captured some of these tanks which served as a model for their M11/39 and M13/40 light/medium tanks. In 1939, during the Soviet-Finnish Winter War, the Finnish armoured forces consisted of around thirty-two obsolete Renault FT-17 tanks, some Vickers-Carden-Lloyd Mk. IVs and Model 33s, which were equipped with machine guns, and 26 Vickers Armstrongs 6-ton tanks. The latter had been re-equipped with 37 mm Bofors AT-guns after the outbreak of the war. Only 13 of these tanks managed to get to the front in time to participate in the battles. At the Battle of Honkaniemi on February 26, 1940, the Finns employed their Vickers tanks for the first - and only - time against Russian armour during the Winter War. The results were disastrous. Of the thirteen available Finnish Vickers 6-ton tanks only six were in fighting condition and able to participate in the first assault on the Soviet lines - to make matters worse, one of the tanks was forced to stop, unable to cross a wide trench. The remaining five continued onwards a few hundred meters but ran into dozens of Soviet tanks in the village of Honkaniemi. The Finnish tanks managed to knock out three Soviet tanks but were soon themselves knocked-out. In the skirmishes that followed, the Finns lost two more Vickers tanks. 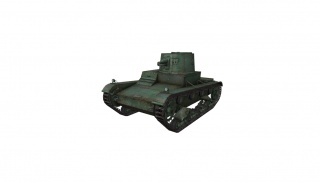 In 1941, the Finns rearmed their Vickers 6-Ton tanks with the Soviet 45 mm gun and re-designated them as T-26E. These tanks were used by the Finnish Army during the Continuation War. 19 rebuilt Vickers tanks, along with 75 T-26s continued in Finnish service after the end of the Second World War. Some of these tanks were kept as training tanks until 1959, when they were finally phased out and replaced by newer British and Soviet tanks. 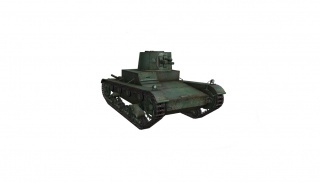 Republic of China used 20 single-turret tanks Vickers Mk.E Type B. They were used in combat against the Japanese in Shanghai in 1937.